When we Study the Major Arcana, we find that there is an intimate relationship between the 22 cards and the Cabala or Tree of Life, as well as theTetragrarnmaton, as covered in the previous chapter. The subject is too complex for me to give you more than a hint of the beauty and profundity that exists here. Those of you with a background in the Cabala will be better able to appreciate this esoteric relationship, but it is not necessary to be familiar with the Cabalistic lore to work with the Tarot successfully. I have prepared a chart on page 74 which shows the various relationships in some detail. This is merely for your contemplation and study and need not be fully understood at this point in your work with the Major Arcana. The Cabalistic Tree of Life is a living reality in continuous movement, embracing the secrets of man in relation to the God force from which it— and he—originate. 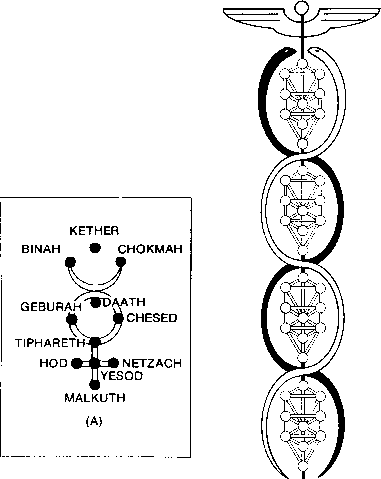 The Cabala (or Kabala) comes from the Hebrew word Qabbalah, meaning ''doctrines received from tradition." In ancient Hebrew literature, the name denoted the entire body of theosophical and religious teachings, except for the Pentateuch. Not until the Middle Ages did the system of esoteric wisdom that we know today as Cabalism come into being, refined and studied only by Hebrew and some medieval Christian scholars. The Tree reflects all the possibilities of man — the various choices he can and must make in his soul's journey back to God. Within its branches, man is like a bird: he can sing to the heavens and give thanks for his universal blessings as he recognizes the solidity of its trunk and senses the depths of its roots. Or he can build himself a cozy nest on one of the branches and be concerned only with his own comfort and immediate material existence, congratulating himself on his cleverness at finding security for himself and his family, and forgetting that he is actually abiding within the Tree that provides for all his needs. The Major Arcana are divided into three groups of seven cards each, called SEPTENARIES. These in turn correspond to the three main triads or TERNARIES of the Cabalistic Tree. This division intensifies in our minds the cogni2ance of the Divine Trinity. Each Septenary represents the progress of man on earth, and within each are the lessons man must learn to return to his heavenly heritage. SEPTENARY ONE includes all the Major Arcana symbols represented by the active spiritual force of the YOD in the Tetragrammaton, which also embraces the influence of the sccond HE. 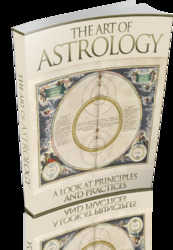 SEPTENARY TWO includes all the Major Arcana symbols represented by the passive receptive force of the first HE. SEPTENARY THREE includes ail the Major Arcana symbols represented by the resulting neutral force of the VAU. Contained within this spiritual network lies the wisdom of the Cabala, and the intimately related Tarot deck of 78 symbols are part of its living force. The objective of any divination is to seek out the spiritual energies which correlate exactly with a given phenomenon or circumstance, much as an automobile speedometer registers and reveals the speed at which the machine is traveling.